What Do I Do If I'm Hit By Someone Driving A Rental Car? If you've been hit by someone who was driving a rental car, the most important thing you should do is get checked out by a medical doctor. It's very important for anyone who is hurt in a car accident to get medically evaluated so that injuries are documented and causation of those injuries can be established. The next most important step is to gather as much information as possible about the at-fault driver, including the vehicle he or she was driving at the time and any insurance policies that might apply. If the renter does not own a car or have their own car insurance, the rental company will typically sell them a temporary insurance policy. There are a number of details that can be sorted out later on, but there are a few key pieces of information that you must have in order to have a chance at holding the at-fault driver accountable for hitting you. If the person who was driving owns a car of their own, they should have insurance. Liability coverage actually follows the driver, not the car, so that person’s car insurance should cover you even though the vehicle they hit you with wasn’t the car they own. If the person who was driving does not own their own car, they may not have their own car insurance. The rental company should have sold them insurance when they rented the car. If the driver at fault can’t remember the details of that plan, get in touch with the rental car company directly to figure out what to do. Even easy-to-use services like Zipcar and Car2Go must make sure that drivers have some liability coverage. Be aware, however, that Zipcar’s insurance and Car2Go’s plan have the bare minimum liability coverage. It’s possible that the person who hit you has a non-owner’s auto policy if they’re a frequent renter. Non-owner car insurance can be more robust in its liability coverage than the bare-bones plans that rental car companies tack on. Ask the person who hit you if they have any form of non-owner insurance. Some credit card companies will also offer secondary rental car insurance, including collision protection, if certain conditions are met. Ask the driver who hit you if they have any sort of alternative insurance that might cover a rental car. Once you have documentation about the driver and the insurance company which owns the vehicle that hit you, it may be time to file a claim. You can file a claim with the insurance company or companies involved, including your own if necessary. It is usually a good idea to get the claims process started as soon as you have a better understanding of your injuries and other medical diagnoses as insurance companies will often deny claims when they are reported well after the incident occurred. We are often contacted by people in these scenarios who want to file a lawsuit against the rental company, particularly in situations where insurance coverage is limited or nonexistent. Unfortunately, if you’re hit by a rental car you cannot sue the rental car company. Federal law protects car rental companies from liability in situations like this. As mentioned earlier, the rental company may have provided the driver with an insurance policy for the duration of the rental agreement. Some car rental companies will inform injured victims about the existence of this type of policy, so you may want to check with the rental company. Not all car accident claims require the assistance of an attorney. 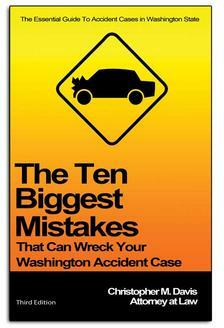 In fact, a majority of motor vehicle collisions are minor and can be resolved without having to hire a lawyer. However, if you were badly injured and may suffer significant damages in the form of medical bills, lost wages, loss of consortium, and/or permanent injuries, it may be in your best interests to consult with an experienced attorney. The top-rated personal injury attorneys at Davis Law Group have extensive experience representing victims in collisions involving rental cars and will review your case absolutely free. Call (206) 727-4000 or use the confidential contact form on this page to have your case reviewed by our award-winning legal team.